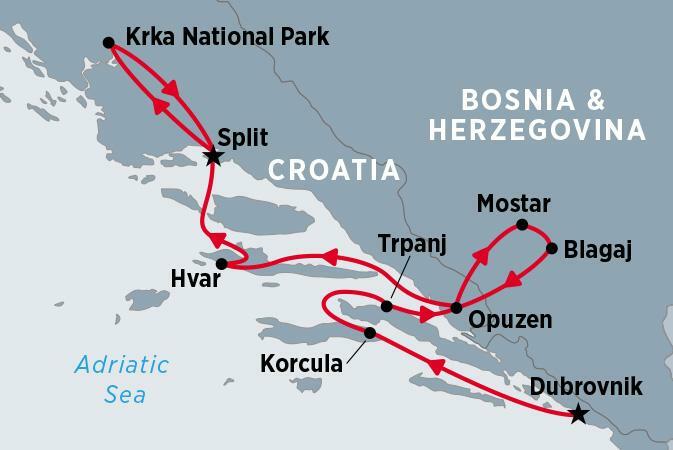 Experience old-world charm of Croatia on a small ship adventure cruise along the Dalmation Coast. An idyllic island escape in the middle of Europe, Croatia offers up impressive coastlines, meandering rivers, and the sparkling waters of the Adriatic to swim in. Alongside the natural beauty of national parks and stunning beaches, enjoy regular doses of the region’s unique culture and tastes. Aboard the M/S Peregrine Dalmatia, specifically built to sail the Dalmatian Coast, cast off from Dubrovnik and cruise to islands both chic and ancient. Explore the romantic and evocative Old Town of Korcula and enjoy tastings at a local winery. Board wooden boats and sail up the River Neretva to Bosnia and Herzegovina, stopping in Mostar, a town situated in a beautiful valley in the high mountains. Navigate the Adriatic to the Renaissance facades and jagged limestone cliffs of Hvar, then discover the soul of Croatia – Split.